The euphoria that heralded the summer rally in silver prices has now dissipated and is as good as dead as silver prices drift lower. Silver made a valiant attempt to breach the $25.00 level in August but could not maintain its momentum and has since drifted lower to trade at around $21.00/oz today. Its big sister, gold, has also ran out of steam having peaked at around $1420/oz, it is now struggling to get above $1300/oz level. Since the heady days of almost $50.00/oz, silver has suffered through a number of false dawns with this summer’s effort now sadly joining that list of failed attempts to rally and challenge old highs. We are aware that the demand for physical silver is alive and well and needed for such industrial purposes as solar panels and that various mints around the world are from time to time sold out of their offerings of silver bars and coins for investment purposes. We are also aware of the paper market, as represented by the COMEX, frequently suffers from sellers who dump large amounts of paper contracts at odd times throughout the trading day, thus sending prices lower. We can shout about this situation all day long but we do not have the power to change it and investing against it has been a disaster for some. As gold and silver bulls we need to recognize that nothing goes up in a straight line and that there are bumps along the way. This current bull market in the precious metals sector is going through a downturn, a bear phase within a bull market if you wish. This year alone silver has fallen from around $30/oz at the beginning of 2013 to around $21/oz today, that’s a 30% loss in value, so silver now requires a 50% increase in the price to get it back to the $30/oz level. This is not impossible, but at the moment it is a big ask for any commodity. So you have a choice; you can fight it or recognize that the trend is your friend and go with the flow. There will come a time when this bear phase exhausts itself and we can hit the acquisition trail with some gusto, so we must remain vigilant and look for those indicators that will alert us to a future change of direction. Until you are confident about silvers direction, keeping a fair amount of cash on the side-lines is not such a bad idea, after all the US Dollar started the year at around 80.5 on the US Dollar Index, which is where it stands today, so those dollars will buy you a lot more silver now than they would have in January 2013. 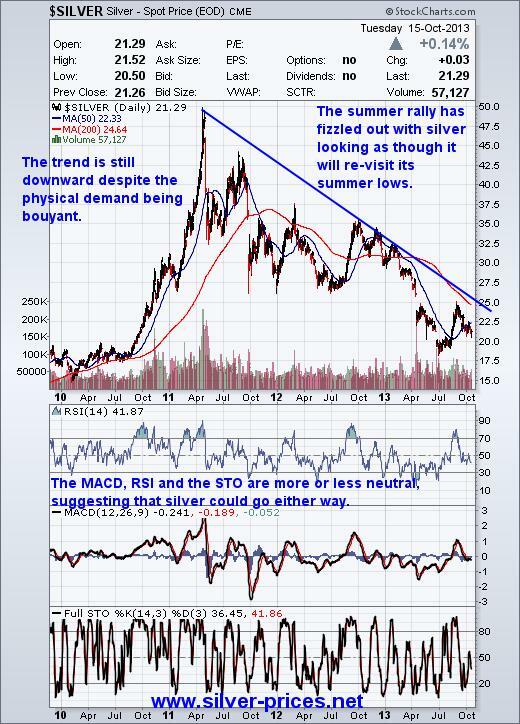 Taking a quick look at the chart we can see that the summer rally has fizzled out with silver looking as though it will re-visit its summer lows. The trend is still downward despite the physical demand being buoyant. The MACD, RSI and the STO are more or less neutral, suggesting that silver could go either way. For what it is worth we think that silver will trade in the teens before we see a resumption of the rally in silver prices or their associated stocks, so go gently out there.